Samuel Timothy "Tim" McGraw (born May 1, 1967) is an American country singer and actor. Many of McGraw's albums and singles have topped the country music charts, leading him to achieve total album sales in excess of 40 million units. He is married to country singer Faith Hill and is the son of former baseball player Tug McGraw. His trademark hit songs include "Indian Outlaw", "Don't Take the Girl", "I Like It, I Love It", "Something Like That", "It's Your Love" (featuring his wife, Faith Hill), and "Live Like You Were Dying". 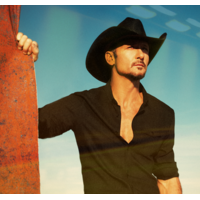 McGraw had 11 consecutive albums debut at Number One on the Billboard albums charts. Twenty-one singles hit No. 1 on the Billboard Hot Country 100 chart. Three singles became the No. 1 country song of the year ("It's Your Love", "Just To See You Smile", and "Live Like You Were Dying"). He has won 3 Grammys, 14 Academy of Country Music awards, 11 Country Music Association (CMA) awards, 10 American Music Awards, and 3 People's Choice Awards. His Soul2Soul II Tour with Faith Hill is the highest grossing tour in country music history, and one of the top five among all genres of music. McGraw has ventured into acting, with supporting roles in The Blind Side (with Sandra Bullock), Friday Night Lights, The Kingdom, and Four Christmases (with Vince Vaughn and Reese Witherspoon), and lead roles in Flicka (2006) and Country Strong (2010). He was a minority owner of the Arena Football League's Nashville Kats. Taylor Swift's debut single, "Tim McGraw", refers to him and his song, "Can't Tell Me Nothin'". In honor of his Italian-American heritage, McGraw was honored by the National Italian American Foundation (NIAF) in 2004, receiving the NIAF Special Achievement Award in Music during the Foundation's 29th Anniversary Gala.